Three years ago, Sybella escaped her horrific past and was placed under the protection and guidance of the sisters of St. Mortain so that she could embrace her heritage as handmaiden of Death. Deeply traumatized and and a victim of unimaginable ruthlessness, serving Mortain and surviving her past has given Sybella a purpose, however nebulous, and a reason to climb out of the deep pit of her despair. As the threat of war encroaches ever closer to Brittany, the Duchess Anne finds herself besieged both from without and within. Angry at the duchess’s continued refusal to honor their betrothal, d’Albret is hellbent on having her hand in marriage, and the power and land that comes with such a union. Likewise, the French are determined to take Brittany for their own. Her enemies closing in on all sides, Anne has few faithful allies and even fewer options. Their convent committed to the continuing autonomy of Brittany, the Abbess of St. Mortain sends Sybella on her most challenging and most critical assignment yet, back into the personal hell she hoped never to return to, her father’s household. Sybella. When she is introduced in Grave Mercy, I’m ashamed to say that I wrote Sybella off as… and how to put this delicately… “ the psycho chick who might burn the abbey down for kicks.” After just several pages of Dark Triumph, I came to realize that my initial, snap judgment of her was unfair and wrong. Sybella isn’t crazy, but rather utterly broken. Coming from a childhood far more brutal than Ismae’s, the sheer amount of physical and emotional brutality Sybella has endured in her short, tragic lifetime is staggering and heartrending. A weaker person wouldn’t have survived what she did. From the outside, Sybella appears acerbic, calculating, uncaring, and unaffected by the schemes and the violence being perpetrated by her family – she’s every inch her father’s daughter. It’s a mask she must wear to mask her fears and insecurities, a facade created to protect herself from her father and those loyal to him, but also to protect her already fragile heart. Surviving under her father’s roof is a bit like jumping into a shark tank with only razor wire as a tether, and performing her duties as Death’s handmaiden under her father’s constant scrutiny is infinitely worse. Sybella must tread carefully, or he’ll suss out her vulnerabilities and destroy her. Though Sybella is indeed at times naturally caustic, and emotionally distant, her carefully crafted disguise hides a lonely, damaged girl overwhelmed by guilt, despair, issues of self-worth, a wavering conviction, a weariness of being manipulated and a failing will. However, she’s not ready to give up completely, first she must complete the mission she’s been given – rescue one of the Duchess’s brave and loyal knights from her father’s dungeon. And in this darkest of places, Sybella may have just found the ray of hope she’s been seeking. The Beast of Waroch. For all that he’s described as being physically “ugly” as his name might suggest, Beast is in possession of a beautiful heart. He, like Sybella, is an instrument of death, a great warrior, a man who revels in battle and the fight. He too has withstood more than his fair share of heartache and tragedy, but despite this, he’s just so… unflaggingly cheerful. Understanding, honorable, compassionate, funny, protective, a little reckless and completely charming, he’s a character that endeared himself to me instantly. Beast’s optimism is infectious, and it mystifies Sybella to no end how he can find so much happiness in a world that holds so much cruelty and injustice. Romance. While the romance between Sybella and Beast builds at a simmering, slow-burn throughout the novel, their initial connection seemed to happen a little too fast. However, taking into account that they are both keenly aware of how fleeting life can be and how decisive they both are, I suppose their suddenness of feeling isn’t all that surprising. Nevertheless, their interactions are interesting to watch, as Beast’s light begins to brighten Sybella’s darkness. Their fledgling relationship helps spur some of her individual character growth, and gives Beast a chance at absolution for past regrets. But when it becomes a question of love or duty, which will win out? Story. For those who were frightened off by the historical aspect of Grave Mercy, let me say that while Dark Triumph still includes some historical detail, it’s not nearly as heavy… at all. And even though some of the events and people incorporated about actually happened and existed, if one was unaware of the history behind this series, it could simply be considered a lush and intricate fantasy. Instead of being heavily historical, Dark Triumph is much more focused on the individual growth of Sybella as a character. Though it’s a slight shift in tone, it works very well for Sybella’s story. And despite Dark Triumph being a more character-driven novel, it proves to be just as deliciously political, just as full of intrigue, danger and urgency as the first book. It definitely doesn’t lack for action, adventure and excitement as the plot moves along very quickly and the situation grows increasingly more volatile and dire with the turn of every page. Overall. 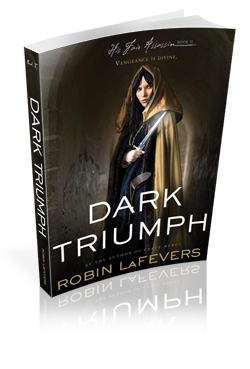 With a fabulous romance and a heartachingly sympathetic heroine (who I just wanted to hug despite the fact that she knows at least 50 different ways to maim or kill me) set against a lovely backdrop that seamlessly blends fantasy and history, Dark Triumph is a wonderful continuation of the His Fair Assassin trilogy. Great review! This one is still sitting on my shelf, begging to be read. I can’t wait to tear into it. You gots to, and soon (because it’s not like you have anything else to read, right???)! lol 😉 I’m looking forward to your thoughts on this one! This was definitely one of my favorite books this year (I know it’s only April but there’s been a lot of books read). I was very disappointed when I heard the main character was going to be Sybella but I ended up loving her. This was a great story!